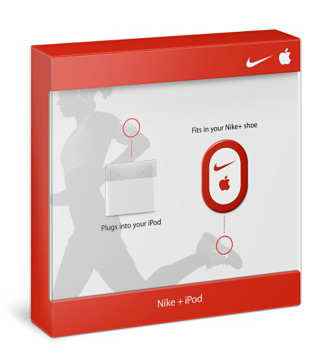 Transform your iPod nano, iPod touch (2nd generation), or iPhone 3G S into a personal workout coach with the Nike + iPod Sport Kit. This wireless sensor and receiver combination works exclusively with your Nike+ shoes and iPod nano, iPod touch, or iPhone 3G S to give you real-time feedback during workouts and let you track your performance on your Mac or PC. Thanks to an unique partnership between Nike and Apple, your iPod nano, iPod touch (2nd generation), or iPhone 3G S becomes your coach. Your personal trainer. Your favorite workout companion. Insert the wireless sensor inside the custom, built-in pocket beneath the insole of your Nike+ shoe, then plug the receiver into the Dock connector on your iPod nano. The iPod touch (2nd generation) and iPhone 3G S includes built-in support for the system — no receiver necessary. Now start your workout. As your run or walk, the sensor sends information to your device, tracking your time, distance, pace, and calories burned. If you choose, real-time, spoken feedback can even alert you to milestones throughout your workout. Back at your computer, sync your iPod or iPhone 3G S to transfer your workout data to iTunes and nikeplus.com. There, you can evaluate your performance history, set goals, and even challenge other runners to a virtual race. But you can buy it at Amazon or Apple Store , this is where we took description from.